Asher Brown Durand (1796-1886). Artist associated with 2 portraits. John Trumbull (1756-1843). Artist associated with 1 portrait. John Adams (1735-1826), President of the United States; signer of the Declaration of Independence. Sitter in 1 portrait. Samuel Adams (1722-1803), Signer of the Declaration of Independence. Sitter in 1 portrait. Josiah Bartlett (1729-1795), Signer of the Declaration of Independence. Sitter in 1 portrait. Charles Carroll (1737-1832), United States Senator; signer of the Declaration of Independence. Sitter in 1 portrait. Samuel Chase (1741-1811), Lawyer and signer of the Declaration of Independence. Sitter in 1 portrait. Abraham Clark (1726-1794), Signer of the Declaration of Independence. Sitter in 1 portrait. George Clinton (1739-1812), Vice-president of the United States. Sitter in 1 portrait. George Clymer (1739-1813), Signer of the Declaration of Independence. Sitter in 1 portrait. John Dickinson (1732-1808), Lawyer and politician. Sitter in 1 portrait. William Ellery (1727-1820), Lawyer and signer of the Declaration of Independence. Sitter in 1 portrait. William Floyd (1734-1821), Signer of the Declaration of Independence. Sitter in 1 portrait. Elbridge Gerry (1744-1814), Signer of the Declaration of Independence; the word 'Gerrymandering' was coined about him. Sitter in 1 portrait. John Hancock (1736 or 1737-1793), Governor of Massachusetts; signer of the Declaration of Independence. Sitter in 2 portraits. Benjamin Harrison (1726-1791), Signer of the Declaration of Independence. Sitter in 1 portrait. Joseph Hewes (1730-1779), Signer of the Declaration of Independence. Sitter in 1 portrait. Thomas Heyward (1746-1809), Lawyer and signer of the Declaration of Independence. Sitter in 1 portrait. William Hooper (1742-1790), Signer of the Declaration of Independence. Sitter in 1 portrait. Stephen Hopkins (1707-1785), Signer of the Declaration of Independence. Sitter in 1 portrait. Francis Hopkinson (1737-1791), Lawyer and signer of the Declaration of Independence. Sitter in 1 portrait. Samuel Huntington (1731-1796), Lawyer and signer of the Declaration of Independence. Sitter in 1 portrait. Thomas Jefferson (1743-1826), President of the United States; signer of the Declaration of Independence. Sitter in 2 portraits. Richard Henry Lee (1732-1794), United States Senator; signer of the Declaration of Independence. Sitter in 1 portrait. Francis Lewis (1713-1802), Signer of the Declaration of Independence. Sitter in 1 portrait. Philip Livingston (1716-1778), Signer of the Declaration of Independence. Sitter in 1 portrait. Robert R. Livingston (1746-1813), Lawyer and politician. Sitter in 1 portrait. Thomas Lynch (1749-1779), Signer of the Declaration of Independence. Sitter in 1 portrait. Thomas McKean (1734-1817), Lawyer; signer of the Declaration of Independence. Sitter in 1 portrait. Arthur Middleton (1742-1787), Lawyer and signer of the Declaration of Independence. Sitter in 1 portrait. Lewis Morris (1726-1798), Signer of the Declaration of Independence. Sitter in 1 portrait. Robert Morris (1734-1806), United States Senator; signer of the Declaration of Independence. Sitter in 1 portrait. Thomas Nelson (1738-1789), Signer of the Declaration of Independence; Governor of Virginia. Sitter in 1 portrait. William Paca (1740-1799), Signer of the Declaration of Independence. Sitter in 1 portrait. Robert Treat Paine (1731-1814), Lawyer and signer of the Declaration of Independence. Sitter in 1 portrait. George Read (1733-1798), Lawyer; signer of the Declaration of Independence; United States Senator. Sitter in 1 portrait. Benjamin Rush (1745-1813), Signer of the Declaration of Independence. Sitter in 1 portrait. Edward Rutledge (1749-1800), Lawyer; signer of the Declaration of Independence. Sitter in 1 portrait. Roger Sherman (1721-1793), Lawyer, United States Senator and signer of the Declaration of Independence. Sitter in 1 portrait. Richard Stockton (1730-1781), Lawyer and signer of the Declaration of Independence. Sitter in 1 portrait. Charles Thomson (1729-1824), Secretary to United States Congress; translator of the bible. Sitter in 1 portrait. George Walton (1741-1804), Lawyer, United States Senator and signer of the Declaration of Independence. Sitter in 1 portrait. William Whipple (1730-1785), Signer of the Declaration of Independence. Sitter in 1 portrait. William Williams (1731-1811), Lawyer; signer of the Declaration of Independence. Sitter in 1 portrait. Thomas Willing (1731-1821), Banker and politician. Sitter in 1 portrait. James Wilson (1742-1798), Lawyer and signer of the Declaration of Independence. Sitter in 1 portrait. John Witherspoon (1723-1794), Presbyterian minister; signer of the Declaration of Independence. Sitter in 1 portrait. Oliver Wolcott (1726-1797), Lawyer; signer of the Declaration of Independence. Sitter in 1 portrait. George Wythe (1726-1806), Lawyer; signer of the Declaration of Independence. Sitter in 1 portrait. 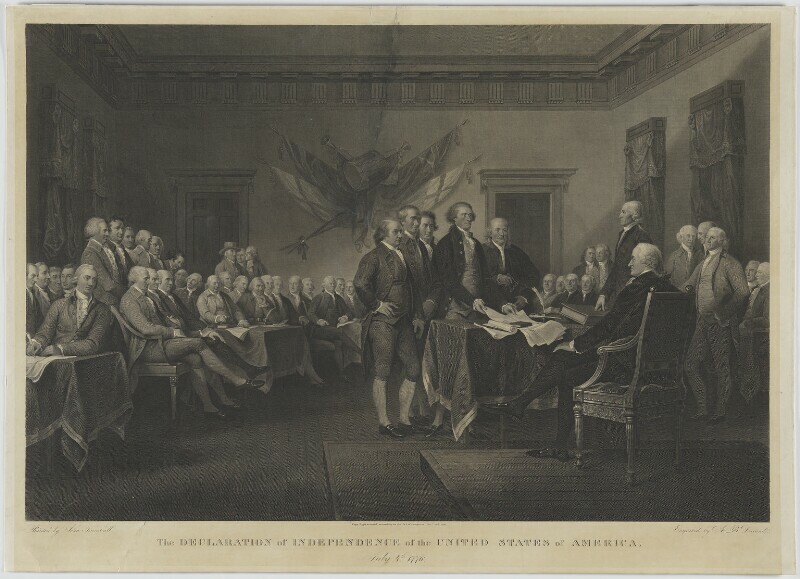 The artist, John Trumbull, has shown the moment on 28 June 1776 when the American Declaration of Independence was submitted for the consideration of Congress. In the centre, Thomas Jefferson presents the document to John Hancock, then President of Congress. Around Jefferson are the other members of the drafting committee: John Adams, Roger Sherman, Robert Livingston and Benjamin Franklin.